of gastronomy that is preparing Christmas dinner — a labour of love that started a whole month before the climax (beat that, Sting). I’m not making any extreme claims of epicurean expertise. After all this is Christmas dinner — Sunday dinner on steroids — although some of the supermarket advertising on TV this year has stirred up controversy by suggesting this is beyond anyone but ‘mum’. My culinary achievements are much overshadowed by my old secondary school friend, David Wilkinson, who puts mouthwatering photos of his ambitious creations (such as Kale Chips and Fruit Kimchi — not together, though) on Facebook pages and his blog Nothing But Onions. But now to my cooking. 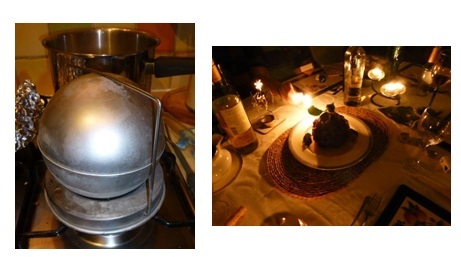 It would be interesting to see if my style of cooking has any parallels with the way I write. 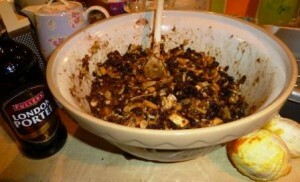 Perhaps there’s a parallel with my Christmas Pudding and Christmas Cake making — a sensory profusion of fruity ingredients, loads of booze involved, it takes ages to get to the table and I made so much mixture that there’s still a bit left over in the fridge that I’m reluctant to throw away? Looks rather unpromising in the bowl — mind you, the beer looks tempting — but on the day it will become the pièce de résistance. Driving down the narrow lane to the farm I had several close encounters with other ethical turkey customers, many somewhat weakening their eco-credentials by driving tank-like 4x4s (probably using their vehicles for the only time in the year on the sort of road they were designed for). In an even more River Cottage touch I had to drive through this on Christmas Eve — makes negotiating the Waitrose car park in Thame look slightly less of a perilous hazard by comparison (although it’s a mean middle-class battlefield when people stampede for the red sprouts and Heston puddings). Turkey collected, it’s time to do all the boring, necessary stuff like chop all the veg. But being Christmas (and actually also because it’s miles cheaper than buying the stuff pre-made in the supermarket) I also made my own breadcrumbs. These were destined for both the bacon-wrapped stuffing balls and, possibly my favourite dish of the whole meal, bread sauce. I possess the basic cookery knowledge that chopped onion and garlic sweated a long time in a pan gives savoury dishes the flavour equivalent of a satisfying bass note — a subtle depth that’s usually only noticeable by its absence. A chopping board of alliums was given the sauna treatment. I can’t say all this chopping and preparing is much fun but the exception is creating the clove studded onion that’s used to infuse the bread sauce. I always think it’s like a tiny alien space ship that’s landed in the pan of milk — or a mine, but that’s not very Christmassy. The turkey giblets go into making proper stock — this precious home-made liquid that’s so much more nutritious and worthy than the cubed or powdered stuff but that still never seems to get used beyond the Christmas gravy. While the preparations were underway, sustenance was needed for dinner on Christmas Eve so I baked some salmon in foil, marinaded in plenty of white wine, naturally. And, as Delia instructs, mince pies have to be baked to the strains of carols from King’s (or was it sausage rolls?). I also got ahead with the bread sauce, which looks far better in the pan that it eventually did in the serving dish but its savoury clove taste is appropriately divine. Salmon, of the smoked variety cooked with scrambled egg also goes well with a glass of nice fizz on Christmas morning — something I first made after that Denis Healey ‘puts the top hat on it’ advert from the days when Sainsbury’s was almost as Waitrose as Waitrose. I don’t think Denis did it but marinading the salmon in cream overnight doesn’t seem to do any harm — nor adding a little flat-leaved parsley. Refuelled by the Champagne Socialist scrambed eggs on toast, it was then to the main business of cooking the turkey and, most crucially, getting everything ready to serve with it. 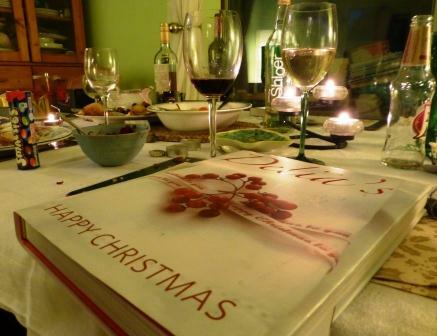 This is the aspect of Christmas dinner which I think is more like project management than cooking (and if my dinner had been delivered like some of the projects in the organisation where I do my day-job I think it would have been lucky to be on the table by New Year’s Day or Easter or, more likely be frazzled and cancelled altogether with the diners sent a huge bill). Those roasties are pure foodie p&rn — ampersand to discourage spammers and perverts who I’m sure will be very disappointed to find only a well-greased King Edward. Even so, they’re enough to set my heart racing (although the accumulations of duck fat might slow it down a bit). I guess this is also where cooking at home starts to slightly take on the stresses of a professional kitchen. Although they will be co-ordinating many dishes to many different times, it’s still quite gratifying to get the roast potatoes, pigs-in-blankets, sprouts, carrots and so on to the table before everything else goes cold. Then there’s the Christmas tradition of being paranoid about whether the turkey is properly cooked or not. I looked through several different books, magazines and websites to find a consensus about how long to cook it and at what temperature — but they were all different. No wonder people get confused. I probably cook mine longer than necessary but to stop it drying out I put some flavoursome things in the cavity — lemons, onions, herbs, garlic — but not too many to stop the air circulating. 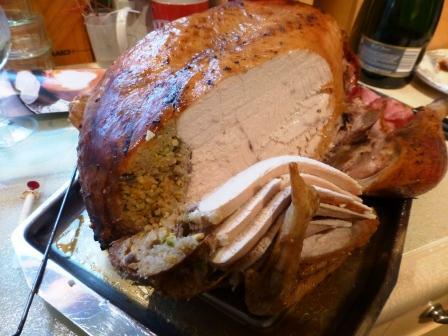 Instead of putting the stuffing inside the turkey, I use a method which isn’t for the squeamish (and for which it helps to have had a glass or two of early morning fizz) that involves pushing the stuffing into the neck and then between the skin of the breast and the meat underneath. It looks good when the turkey’s carved if it’s been worked through well enough under the skin. That’s a rice, mushroom, apricot and pistachio stuffing, by the way. The breadcrumbs went into the ‘other stuffing’ with sausagemeat. Of course, after a huge meal with unnecessary accompaniments like devils on horseback and homemade cranberry and orange sauce as well as all the above, it’s utter madness to follow it with even more calories but that’s what tradition — and Delia — insists on. As well as Delia’s cake, I made a dessert that Delia may well have approved of but isn’t in her Christmas bible — a jelly made from almost 100% port — just a little added lemon juice. Next time I may add a bit of sugar to sweeten it but the jelly did its job of making everyone jolly — as did the cake, fed on a diet of brandy and calvados. But to finish almost where this post started — the end result of that unpromising sludgy-stuff in the mixing bowl was repacked into its mould (again looking so much like an alien craft I wonder if it was made in Roswell), steamed for a couple of hours and then soaked in hot brandy and ritually immolated (a process bound to kill off any extra-terrestrial life-forms, just in case). An Alien Craft or a Pocket Magnox Reactor? So, yes, I do cook but, like a few other interests, it’s something I’ve cut back on the time I spend doing while I’ve been writing this novel — although I do cook a lot more often than once a year, it’s the Christmas dinner that is the most intensive burst of activity so, given the general lack of other evidence of my foodie interests, hopefully this post has redressed the balance rather than been self-indulgent. I suppose cooking a big meal is a bit like writing in that you put in a lot of preparation, transforming your ingredients into an something that you enjoy yourself but also hope that others will appreciate too. 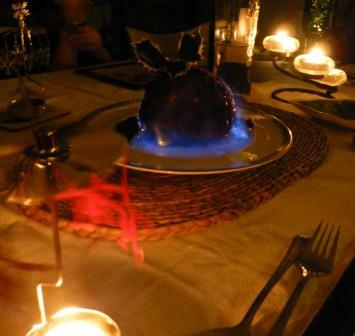 And hopefully both the writing and the Christmas dinner will leave a final impression that’s a little memorable and entertaining — there’s nothing quite like a flaming pudding.